One of the bigger quirks of iOS 8 running on iPhone 6 and iPhone 6 Plus is the Reachability feature in these devices, which essentially allows for a convenient one-handed operation despite the large display size of both these phones. In reality, Apple’s implementation of one-handed UI for iOS 8 is better than what any other manufacturer has been able to achieve. Still, when you look at Reachability, it’s evident that there’s so much more that can be done with this feature, especially if it’s opened up to developers. Well, that’s what we have jailbreaking for, and thanks to a new tweak released just recently in Cydia, your Reachability space becomes a new multi-tasking interface, providing a mix of the app switcher and Safari’s 3D tabs. This new tweak, labeled Switchability, essentially makes use of the extra space left behind by the Reachability feature and places an app switcher in a neat, 3D or 2D card interface in that area, while the bottom half of your screen continues to display your currently running app. In this manner, this somewhat becomes a representation of true split-screen multitasking on iOS devices, which is something that a lot of people would cherish and appreciate given the larger screen size of iPhone 6 Plus in particular. Switchability also comes with a lot of customization options, allowing you to change the Reachability size slider, your favorite app button, delete button, fonts, layouts, and lots more. 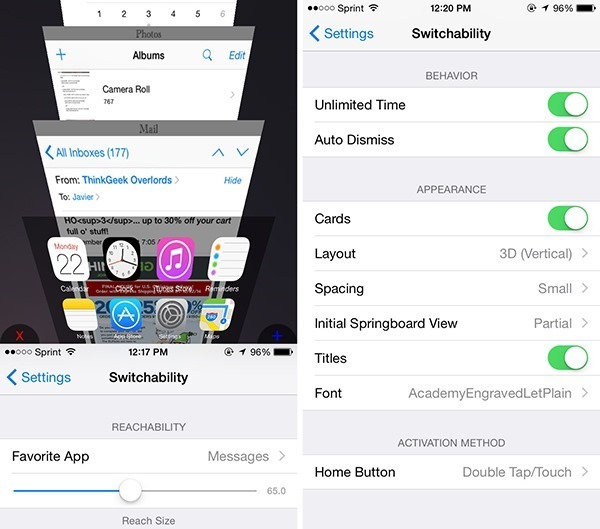 Switchability will set you back $1.99, is available to download from the BigBoss repo in Cydia, and will work with iOS 8+ devices only. Naturally, one of the requirements for this tweak to work is Reachability feature itself, and for now, it’s available only on iPhone 6 and iPhone 6 Plus. However, you can enable Reachability on older devices by installing a tweak such as ReachAll, which will allow you to take advantage of Switchability. It merits mention here that should Switchability not be to your liking (or you don’t want to spend the couple of bucks that it costs), another (free for now) option is ReachApp. It’s another beta tweak that puts the last used app in the Reachability space/view, and that’s pretty much the extent of it. 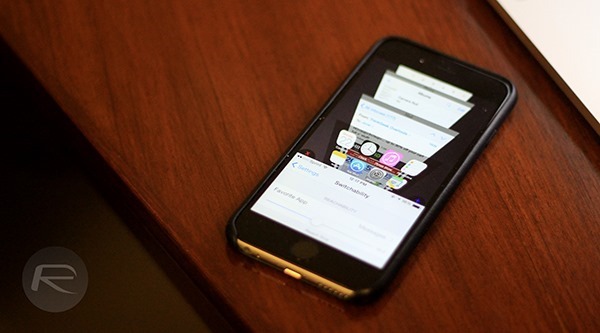 You can read all about it in our coverage of ReachApp here. does it lag or stutter on iphone 6 plus? To close an app you swipe left.